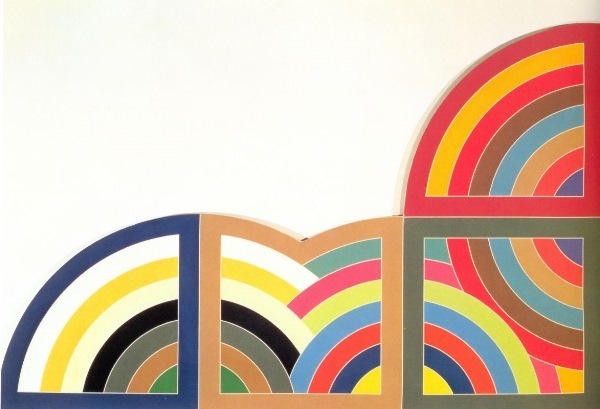 As a teenager, Frank Stella realized that he wasn’t interested in the painting that represented things or people. Influenced by the work of the abstract expressionist Jasper Johns, the artist wanted his paintings to be, themselves, an object; and not just a representation of something else. In the beginning, the artist worked paintings that were monochromatic, in strict black and white, alternating straight stripes in uniform tones. His minimalistic art, when he included curves and colors, became more deconstructed and, in a way, became more pop, but not less abstract and rational. Agbatana II clearly reflects this period. 4 geometric figures in the foreground are linked by circular color stripes at the background of the composition. This linkage between different elements does not surprise us if we know that the work “agbatana” means, literally in Greek, “place of gathering”. ~ by Álvaro Mazzino on May 17, 2011. This might not be the only Jordan that Abloh is working on either—rumor has it there’s also an Air Jordan 4 and possibly an Air Jordan 3 from Off-White on the way. Seales has bravely taken on the slander that’s come her way as a result, with someone noting Jay-Z talked about the idea of wealth building on his recent 4:44 album but criticizing the actress’ approach. This entry was posted on May 17, 2011 at 09:37 and is filed under Abstract.You can follow any responses to this entry through the RSS 2.0 feed.You can leave a response, or trackback from your own site.